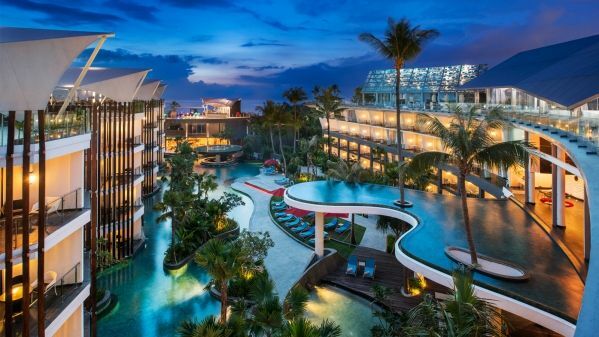 Overlooking Jimbaran Bay, this modern, upscale hotel is a 2-minute walk from the beach and 4 km from Hindu statues at Garuda Wisnu Kencana Cultural Park. Contemporary rooms have floor-to-ceiling windows, and terraces or balconies; some have direct pool access. All offer smart TVs, iPod docks and free Wi-Fi and free-standing baths. Luxe suites and villas add dining areas, and some come with ocean views, whirlpool baths or rooftop terraces with plunge pools. A free buffet breakfast is served in a Pan-Asian restaurant. There are 2 stylish lounges and a vibrant cafe, plus a spa, a fitness center and an outdoor saltwater pool with a swim-up bar. King or Two Queens (by bed type request, no guarantee). In our open, split-level Classic Rooms, sleek modern style—seen in a hanging lamp with crocheted cobalt cover, a soft aqua area rug atop marble flooring, and a striped grey and white accent wall—is juxtaposed with local cultural influences, such as a batik-inspired headboard panel in turquoise and white. Dark brown draperies and dark wood accents contrast pleasantly with the clean, sea-inspired palette. Floor-to-ceiling windows let ample daylight into the space, and lead to a standing terrace. A plush turquoise loveseat brightens the lower-level living area, split off by a long shelf with reading lamp and built-in refreshment centre. Entertainment comes easily thanks to the 42-inch HD LED Smart TV and iPod docking station. A wooden writing desk with media hub connection, dual-line telephone, and complimentary High Speed Internet Access lets you stay in contact and informed. Convenient storage space is available in a walk-in wardrobe. The Turkish marble bathroom offers unexpected pleasures with a deep soaking bathtub and separate, glass-enclosed rainforest shower, plus a water closet for added privacy. At the day's end, discover deep rest in the LM BED—available as a king or two doubles—with crisp linens, plump down pillows, and a soft duvet. King Bed or Two Queens (by bed type request, no guarantee). Split-level interiors with sleek marble flooring and ocean-inspired palettes—reveal a colourful interplay of modern and natural in hanging lamps with crocheted cobalt covers, a grey and yellow bench atop a bright aqua area rug, and dark wood accents. A striped grey and white accent wall adds a playful touch alongside the turquoise batik-inspired headboard. Pool views entice through floor-to-ceiling glass doors, and a furnished terrace lets you relax with a drink or light snack. A plush turquoise loveseat brightens the lower-level living area—split off by a long shelf with reading lamp and built-in refreshment centre—and entertainment comes easily thanks to the 42-inch HD LED Smart TV and iPod docking station. A wooden writing desk with media hub connection, dual-line telephone, and complimentary High Speed Internet Access lets you stay in contact and informed. Convenient storage space is available in a walk-in wardrobe. The Turkish marble bathroom offers unexpected pleasures with a deep soaking bathtub and glass-enclosed rainforest shower, plus a water closet for added privacy. At the day's end, discover deep rest in the LM BED with crisp linens, plump down pillows, and a soft duvet. One King Bed. Split-level interiors with sleek marble flooring and ocean-inspired palettes—reveal a colourful interplay of modern and natural in hanging lamps with crocheted cobalt covers, a grey and yellow bench atop a bright aqua area rug, and dark wood accents. A striped grey and white accent wall adds a playful touch alongside the turquoise batik-inspired headboard. Pool views entice through floor-to-ceiling glass doors, and a furnished terrace lets you relax with a drink or light snack. Guests of our Lagoon Access Rooms enjoy direct pool access from their terrace. A plush turquoise loveseat brightens the lower-level living area—split off by a long shelf with reading lamp and built-in refreshment centre—and entertainment comes easily thanks to the 42-inch HD LED Smart TV and iPod docking station. A wooden writing desk with media hub connection, dual-line telephone, and complimentary High Speed Internet Access lets you stay in contact and informed. Convenient storage space is available in a walk-in wardrobe. The Turkish marble bathroom offers unexpected pleasures with a deep soaking bathtub and glass-enclosed rainforest shower, plus a water closet for added privacy. At the day's end, discover deep rest in the LM BED with crisp linens, plump down pillows, and a soft duvet. King or Two Queens (by bed type request, no guarantee). Our Aqua Studio Suites feature a spacious corner location as well as a furnished terrace with seating for two and refreshing pool views. Contemporary design elements in blue, white, and orange—such as the unique hanging lamps with crocheted cobalt covers—pop against an earthy palette of grey and taupe. An earth-toned throw rug atop sleek marble flooring and a sculpted wooden bench blend traditional essence with modern detail, while a dramatic dark grey accent wall is the perfect backdrop for a batik-inspired headboard in grey and white. Curl up on the plush two-person divan with a hot coffee from the espresso machine or snack from the refreshment centre. Then indulge in state-of-the-art entertainment, from a 42-inch HD LED Smart TV with home theatre system to the iPod docking station. A dining table for four is ideal for gathering for a meal or completing a project, and a media hub connection, dual-line telephone, and complimentary High Speed Internet Access let you stay in contact and informed. Belongings are conveniently stowed in a walk-in wardrobe. At the day's end, discover deep rest in the LM BED with crisp linens, plump down pillows, and a soft duvet. The Turkish marble bathroom offers unexpected pleasures with a deep soaking bathtub and glass-enclosed rainforest shower, plus a water closet for added privacy. Cinq Mondes bath amenities complete the experience.